What are the top landmarks in Hoi An? Nothing says holiday like spending a lazy day at An Bang Beach, a popular beach in Hoi An. Make time for the shops and cycling trails in this relaxing area. With a visit to Hoi An Night Market, a popular shopping spot in Hoi An, you can browse for souvenirs. Make time for the shops and cycling trails in this relaxing area. Go on a shopping and cultural expedition to Hoi An's ancient old town and dine on local specialties in riverfront restaurants. Cửa Đại is a welcoming, relaxing neighbourhood with convenient options for restaurants. Outdoor settings, such as the beaches, riverfront and sunrises, attract many visitors. Minh An is a welcoming, walkable neighbourhood. The neighbourhood’s charm comes through in its friendly people. Other highlights include the local historic landmarks and shopping, as well as the natural splendour of the riverfront. The Cam Pho neighbourhood is known for being walkable and relaxing. The neighbourhood’s charm comes through in its friendly people. You can experience some local historic landmarks, or enjoy the natural beauty of the riverfront. Cam Kim is a welcoming neighbourhood. We loved the quiet escape after the hustle and bustle of down town Hoi An. Excellent staff who were available to answer any questions at any time. We enjoyed the pool area, spa and gym. Plus the breakfast buffet was exceptional. This is the boutique hotel that exceeded my expectation. Great location, friendly staff, and nice facility, while sitting in a quiet corner. Breakfast provided everything to start a day, and happy hour SPA worth every penny. Booked through Expedia, and had extended my stay for the same reasons. Highly recommend and will stay again if visited in the near future. Characterful and rich in history, the attractive town of Hoi An is one of Vietnam's essential destinations. This old port, located on the sandy central coast, boasts stunning beaches, canal-side views and a fascinating architectural blend. This 2,000-year-old settlement draws on Cham, Chinese and Vietnamese influences to present a quaint and curious Old Town, built around its famous network of waterways and a bustling tourist-friendly centre where you'll find most of the best hotels in Hoi An. Hoi An's compact network of streets, alleys and water courses is easy to explore on foot or bicycle, with most of the main attractions close to one another. Any visit to the town should include a tour of its historic centre, whether guided or under your own steam. Key landmarks include the superbly-preserved Phung Hung House, the attractive Fukian Assembly Hall and the Tran Family Chapel. The wood-carved 18th-century Japanese Bridge, complete with a Buddhist temple built into its side, is another essential stop. For a change of pace, head to one of the city's spas for a Vietnamese-style pampering session. Choose from massages, facials and body scrubs, or sit back and enjoy the sights, sounds and smells of your surroundings. For the easiest access, stay in a spa hotel in Hoi An for relaxation right outside your room. 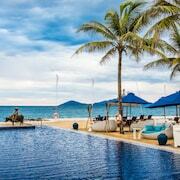 Alternatively, take a trip to Hoi An's calm, enticing beach to sunbathe and swim in the South China Sea. If you're interested in learning more about the town and the wider Quang Nam Province, seek out the Museum of History and Culture, Hoi An Folklore Museum or the Museum of Trade Ceramics. The various museums tell the story of Hoi An's development, from its early origins as a trading port through to the French colonial period and present day. Hoi An is a place to acquaint yourself with traditional Vietnamese cuisine, but also diverse fusion cooking, with flavours from around the world. The latter owes much to the town's strong Chinese, Japanese, Portuguese and French influences, which date back centuries. You can choose between traditional street vendors and popular sit-down restaurants serving everything from the national dish pho to fine dining-inspired miso-glazed bass. If you'd like to learn more about local flavours and culinary techniques, take a cooking class at Thuan Tinh Island just to the east of the town. Under expert instruction, you can find out how classic dishes like banh xeo, pho, and bao are made and served. The various boutique hotels in Hoi An also offer dining options, so it's worth checking out what is being served at your accommodation. What Is the Weather Like in Hoi An? Always take note of the weather when planning a trip to Hoi An. The town's tropical latitude means temperatures remain high all year round, but there are various levels of aridity, humidity and rainfall from season to season. A little preparation helps ensure you pack the right outfits in your suitcase. Fortunately you can cool off in your accommodation – as you'd except, there are plenty of hotels with air conditioning in Hoi An. The calmest weather is in May and June, when the wind blows from the south and the seas are more placid. That said, temperatures are most inviting between February and May, when conditions are mild and the humidity is low. This is the high season for tourists, so it's best to book well advance if you're travelling at this time and looking for cheap accommodation in Hoi An. During the rainy season, which lasts from September until January, Hoi An can be subject to typhoons and flooding. 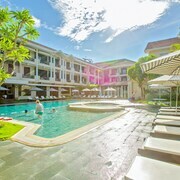 This is the low period for tourism, but can mean there are attractive deals available for hotels in Hoi An. Rough conditions in the South China Sea make the beach less desirable at this time of year and can prevent day trips to the offshore islands. You'll find the biggest concentration of hotels in Hoi An close to the Old Town and waterfront, with some offering attractive views of the Thu Bon River. 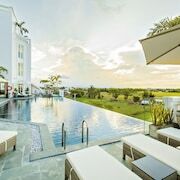 You can choose between four-star accommodation with spa services, characterful boutique hotels and there are even beach hotels in Hoi An and nearby. 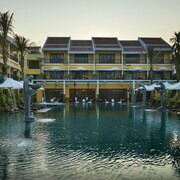 There's a good supply of great-value accommodation in Hoi An, but ensure you book well in advance. Planning a tour of Vietnam? 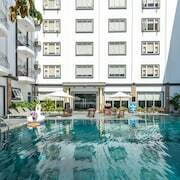 If you're heading to the capital, check out our hotels in Hanoi, or take a look at our Phnom Penh hotels if you're planning to twin Vietnam with a trip to Cambodia. 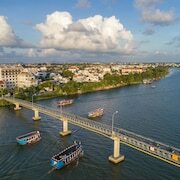 Explore Hoi An with Expedia's Travel Guides to find the best flights, cars, holiday packages and more!